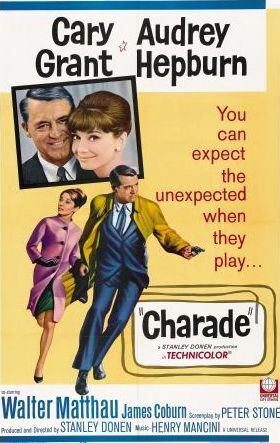 Referred to as “the best Hitchcock movie that Hitchcock never made”, Charade is a 1963 film directed by Stanley Donen, who is most famous for his 1952 musical comedy Singin’ in the Rain. 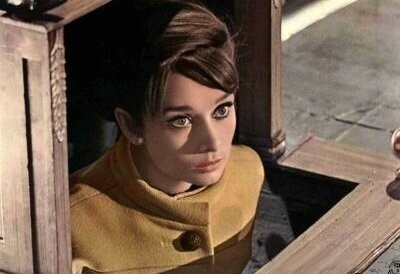 A glorious blend of genres, – romantic comedy, screwball, crime, whodunit, mystery, spy thriller – Charade was filmed in Paris, stars Audrey Hepburn and Cary Grant in the lead roles and contains a score by Henry Mancini. Regina “Reggie” Lampert (Hepburn) first meets a charming stranger who introduces himself as Peter Joshua (Grant) during a skiing holiday in south-eastern France. Reggie is dissatisfied with her marriage to a man called Charles and looking forward to a divorce; Joshua, on the other hand, says he’s already divorced. Upon her return to Paris, Reggie is told by police inspector Edouard Grandpierre that Charles has been murdered and is handed his travel bag with multiple passports, a letter and other items. Soon, she is approached by three odd-looking men who, it is revealed by CIA administrator Hamilton Bartholomew, are survivors of a World War II OSS operation. They, along with Charles and a fifth man called Carson Dyle (considered dead) were supposed to hand over $250,000 in gold to the French Resistance, which they stole instead. Reggie is caught between these three threatening men (Panthollow, Scobie, Gideon) and the dubious Peter Joshua who, first changes his identity to “Alexander Dyle” (brother of the dead Carson Dyle) and then to “Adam Canfield” (a professional thief). Through many plot twists and turns and after cat-and-mouse chases through the streets and subways of Paris, it is revealed that Carson Dyle is alive – he is Hamilton Bartholomew. The sum of $250,000 was converted by Charles into rare stamps and stuck on the envelop in the travel bag in Reggie’s possession. And Peter Joshua/Alexander Dyle/Adam Canfield is ultimately, “Brian Cruikshank”, a government official working for the Treasury Department responsible for the recovery of stolen property. The film has two climactic moments, one suspenseful and serious (the unmasking of Bartholomew as the villain Carson Dyle) another romantic and light-hearted (the unmasking of Adam Canfield as Brian Cruikshank with whom Reggie expresses a desire to have “lots of boys” so that all can be named after him). Watch the opening scene – a flirtatious repartee between Regina Lampert and “Peter Joshua”. Featured: Grant and Hepburn on cover, Universal Pictures. Used for illustrative purposes only. No Copyright Infringement intended.